This isn't some in-and-out-in-45 workout. It's a serious commitment that you'll need lots of time, lots of food, and lots of rest to recover from. Sound like fun? Then you're the right kind of crazy lifter to grow on Jay Cutler's double-dose back training. You know you need to row to grow. You know that big pulls off the ground build big backs. You know you need chin-ups if you want to fill up that shirt. But sometimes, you need something else. You need a full-on, "I can't believe I'm doing this" overload workout. And Jay Cutler's got it. 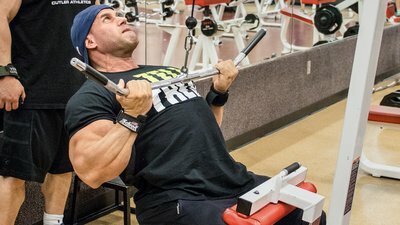 Week 4 of Living Large: Jay Cutler's 8-Week Mass-Building Trainer is legendary for its two-a-day approach for every body part. And the week starts off with one of the biggest pieces of real estate on Jay's immense frame: the back. You may be terrified at the prospect of doing 5 sets of 8-10 reps on the deadlift after having done 18 sets of various rows and pulls in the morning, but consider those a very extended warm-up. If you're someone who has trouble feeling or "setting" your lats during the deadlift, well, you won't today. Give yourself a solid 3-4 hours or more between these workouts, if you can. In that time, eat big, get lots of water, and get everything in your life in order for the next couple of days. Why? Because you might be struggling to get around—in a good way—for a while after this!